Baby weight is one of the most irritating and yet common questions you will be frequently bombarded with at every possible occasion after your child's birth. My son, born at 38 weeks was not considered preterm but since I was diagnosed with gestational diabetes, his weight was constantly monitored during every ultrasound and there began the obsession with weight. He weighed 3.1 kilograms at birth and when we left the hospital he was a few kilograms less, quite expected and common for all babies, we knew. The days that followed were nowhere close to what I expected of motherhood and there came the many questions on weight and whether or not my baby was getting enough to ensure he had that perfect curve on the growth chart. As you already know, babies cry for a lot of reasons but if all else is fine then everyone will quite literally yell and remind you that 'hunger' is the sole reason for crying. It did not help when my almost five-day old son began with severe reflux and everything spiralled out of control from that moment. It's normal for babies to spit some milk for the first couple months but we knew it was excessive when he quite literally was throwing up the milk he had just digested. We held him for hours after feeding, burped him several times and I researched every possible feeding position to help the situation but nothing worked. The reflux was also accompanied with extreme agitation and crying that most certainty indicated an uncomfortable tummy. It was really difficult to tell if he was growing at the right pace, especially when it looked as if most of the milk was being spit up. In spite of this and all the conflicting advice on whether or not he was gaining or losing weight, I decided not to give up and learnt a few things that I would definitely want to share with new mum's dealing with a similar situation. Those first few weeks are important growth moments when your baby will gradually begin to regain the weight lost after birth. 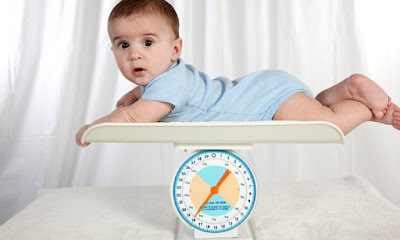 However, you will have scores of people who will talk about growth charts, percentiles, and what not to try and determine if your baby's weight is indeed what it should be. Instead of unnecessary confusion, I waited for my son's first appointment (after approximately 15 days of birth) to discuss all weight and growth related questions with his paediatrician. It was definitely calming to know that he was indeed growing exactly as he should and to reduce the excessive reflux, I began to follow some suggestions and refuse to let it hinder his growth. As mentioned earlier, the excessive spit ups made it difficult to determine if my baby was getting enough milk and this is where pee and poop counts became very important. In the first few weeks, my paediatrician advised that six to eight diapers a day were a good indication that he was feeding well. While the diaper counts were fine, it was still worrying to see him bring up a huge wave of milk and wonder if there really was anything going into his tummy or not. This is where I had to resist the urge to overfeed and instead of rushing to feed him immediately after each reflux episode, I continued to follow the two and half hour gap feeding rule. There were a few instances where he wanted to feed more often so I kept alert for these additional hunger cues to see if the plan was working and it certainly did. Keeping baby in an upright position helped reduce the reflux. It also meant that we had to carry him around much longer and ensure he was burped several times before we put him down. Exhausting, quite definitely and it also meant going back and forth, trying several methods until I found the one that suited my baby the best. It has been two years and my son is growing. Yes, he is a fussy eater, we have our good days and bad. I have learnt not to get too obsessed with growth charts and terms that determine if his growth is where it should be. I have made peace with the fact that there will be people who choose to determine if he's the right height and weight by merely 'looking' at him. There will be countless worries about 'underweight' and 'overweight' but as long as your child is active, achieving the required milestones and eating healthy, that's all that matters.